Sonic’s back in the fray! While I pick on the guy a lot, I’m glad to see him again, and I couldn’t help but feel that there’d be a follow-up to the original rivalry with Mega Man established a few years ago. It helps that Mega Man has some built-in Nintendo buddies, so Sonic might still be seen as a bit of an outlier. It’s cool, though–we all love the hedgehog. When I do longer comics like this, I worry a little about holding the audience’s interest. 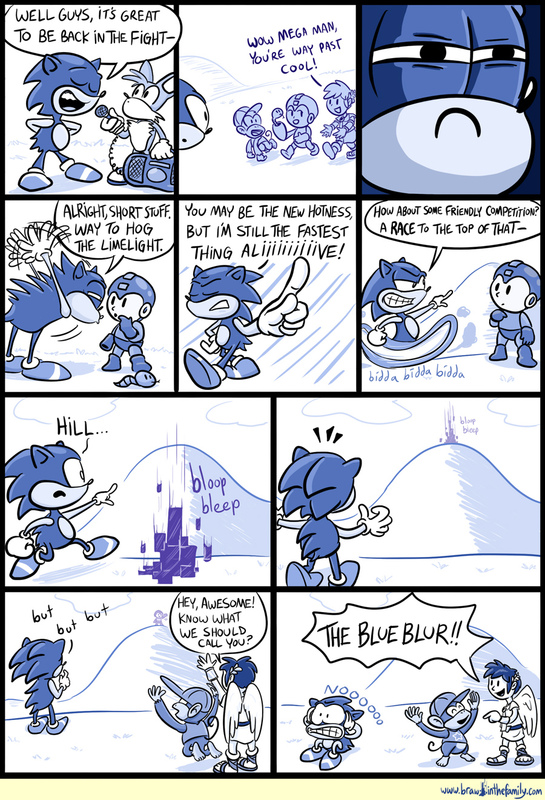 Plenty of people enjoy the original strips for their brevity, but as the gags have become a little more complex, I find that a lot of them require a bit more buildup to be most effective (for instance, this one probably COULD still work without the first three panels, but I felt it’s important to see where Sonic’s jealousy comes from, plus it sets up the “Sonic losing his identity” theme that’s central to the punchline). And when I have longer strips, I try to put in smaller jokes or entertaining moments within the panels themselves (such as the Sonic cartoon callbacks in this particular case, or Mega Man’s snake buddy). But what do you think–could BitF use less panels sometimes? I’d love to work smaller in general (since a 6-panel comic is obviously twice as much work as a 3-panel one) but it’s been pretty difficult to keep panel size down since around comic 200 or so. By the way, non-blue arms, correct shoes! If it weren’t for the fact that he’s completely off-model in every panel, I’d say I’ve finally drawn Sonic perfectly!